Your tooth enamel is the hardest substance in the body; in fact is hardness is similar to steel. Yet despite their hard nature, your teeth can be damaged. No matter how much we want them to stay strong, healthy, and complete for a lifetime, sometimes there are situations needing their extraction. At Ria Family Dental, we look after your best interests. We believe in exhausting all possible solutions to save your tooth. However in the cases when an extraction is needed, we assure you that our tooth extraction is completely safe. The following are the common scenarios in which an extraction is needed. When a tooth decay is detected early, it can be easily stopped and extraction avoided. The decay worsens everyday, however, and the longer you ignore it the higher is the risk of an extraction. The cavity will be too big for any dental restoration to restore hence the extraction. Wisdom teeth, or your third molars, are the last set of teeth to erupt. A dentist may recommend an extraction of a wisdom tooth when it is problematical. Such problems include impaction, gum flaps, and cysts, among others. Correcting jaw problems and malocclusion through orthodontics sometimes requires extraction of a tooth as part of the preparation. Only those teeth which cannot be aligned and are necessary for the orthodontic procedure to be successful, will be extracted. Crowded teeth is a misalignment problem which means that the teeth cannot properly fit in the space or size of the jawbone. Extraction is necessary in this case to improve alignment and bite capacity. Prepares your teeth for orthodontic work. Stops the spread of infection in a dental abscess. Prevent dental issue that might occur from impacted wisdom tooth. 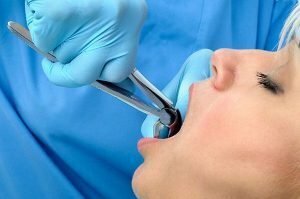 A tooth extraction is a common dental procedure performed with great caution and precision. Your medical history will be checked and your dentist will discuss the use of a local anaesthesia. After the extraction, your dentist will closely monitor your recovery to ensure complete success of the operation. Ria Family Dental also has durable tooth replacement options such as dental implants. Your safety and satisfaction are always our priority. We believe in saving natural teeth as much as is possible. However, should the need arise for an extraction, you can trust your Ria Family Dental for a safe procedure.